Our top 5 beautiful bulbs to plant now for some summer colour! It doesn’t matter how small or grand your outdoor space is, from courtyard to acreage; borders and containers filled with bulb bursting blooms are a versatile and easy way of creating visually spectacular palettes of colour throughout the seasons. Bulbs are not only beautiful, they can also give off the most exquisite fragrance and help create a tropical ambience. If cared for correctly bulbs can also provide colour for many seasons to come. At Aylett Nurseries we have a fantastic selection of summer flowering bulbs for you to choose from. If you are not exactly sure what you are looking for, just ask one of our team who will be delighted to assist you. Bulb is a general term used by gardeners for plants with a food storage organ that allows them to grow and flower once the optimum conditions occur. Spending a little time and effort during March will ensure you and your garden reap the benefit with a glorious show of flowers and colour during the wonderfully warm, summer months. So put on your comfy cosy clothes and spend a little time getting back to nature. To help you, we have put together a list of the best bulbs to be planted now for a show of colour during the summer months. This herbaceous perennial, will reach heights of an impressive 50cm tall and is also known as the ‘African Lily’. Its brilliant sky blue petals make a memorable vision in the garden during the summer months. Agapanthus should be planted in containers to protect them from the harsh winter frosts at a depth of at least 8-10cm and 10-15cm apart, in good quality, well-drained soil. These are one of the most rewarding summer plants possible to grow as they will flower profusely from June to October. As there are upright and pendula varieties available they are ideal for growing in pots, containers and hanging baskets on the patio, or they will make a beautiful flowerbed subject. This striking perennial is better known as the ‘Pineapple Lily’ and with a crown of spiky green leaves sprouting from a head of deep pink flowers, it is easy to see why. These beauties can be grown in a pot at a depth of 15cm or simply transplanted into the ground after the last frost. Where ever you chose to plant them you can expect a tropical visual delight during the summer months. No outdoor space is complete without the presence of the world renowned Lily. The ombre shades of their sizeable petals in pink, ochre and flame are an utter feast for the eyes. 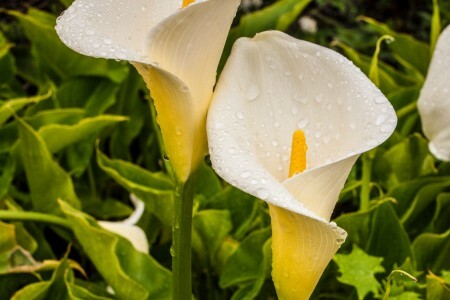 Lillies can be planted in containers or straight into the ground and thrive in a sunny area, planted at a depth of 15-20cm in well drained soil. A herbaceous perennial, Liatris or more commonly known as ‘Blazing Star’ is the perfect choice for anyone wanting to attract butterflies to their outdoor space. Bulbs should be planted in light, well drained soil at a depth of 5cm. The brightly coloured spikes of flower range from pink, purple to white and will create a delicious spread of colour during the summer months. Before planting your bulbs, you might find it useful to check out our top tips. Aylett’s Bulb Planting Top Tips! Buying – When buying, choose bulbs that are firm, fresh and feel heavy for their size, avoid any that are damaged, soft, shrinking or showing signs of mould. Planting Depth – Bulbs generally need to be planted about twice their height depth. Group Together – Plant bulbs in groups; odd numbers of bulbs in each group work best. Generally, the larger the group, the better the display looks. Woodland Planting – If you are going for a random effect in a woodland/wild setting, throw the bulbs in front of you and plant them where they land. Careful Planning – If you would like to mix different varieties of bulbs together, to make the best display be sure to check flowering times and heights, or to make life easier let the experts do the work and choose one of our combination packs. Container Planting – Containers filled with bulbs can really make an impact. Plant bulbs closer in pot than you would in the ground for bigger impact. Water and feed well during the growing season, compost should feel moist but not too wet, it is important not to let the compost dry out completely. 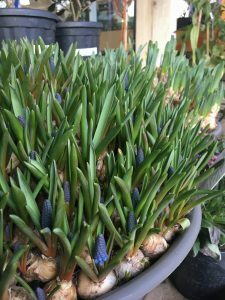 If you are looking for some colour in the garden now, and missed the opportunity to plant some spring flowering bulbs such as hyacinths, daffodils in the autumn, we have a lovely selection of potted bulbs just about to come into flower and add that breath of spring to your garden. For further information on what else you can be doing in your garden during the month of March, take a look at our March tip page. Don’t forget to follow our Instagram account @aylettnurseries to keep up to date with all our seasonal delights. Next Post: Fantastic amount raised on Garden Re-Leaf Day!